Jen H. has lived in her Seattle home for a number of years. She is an urban gardener and huge Seattle Sounders fan! When SolTerra first met with Jen in January 2017, she was in the midst of planning a number of home improvement projects. Her home was built in 1948 and was still using the original oil heat system. 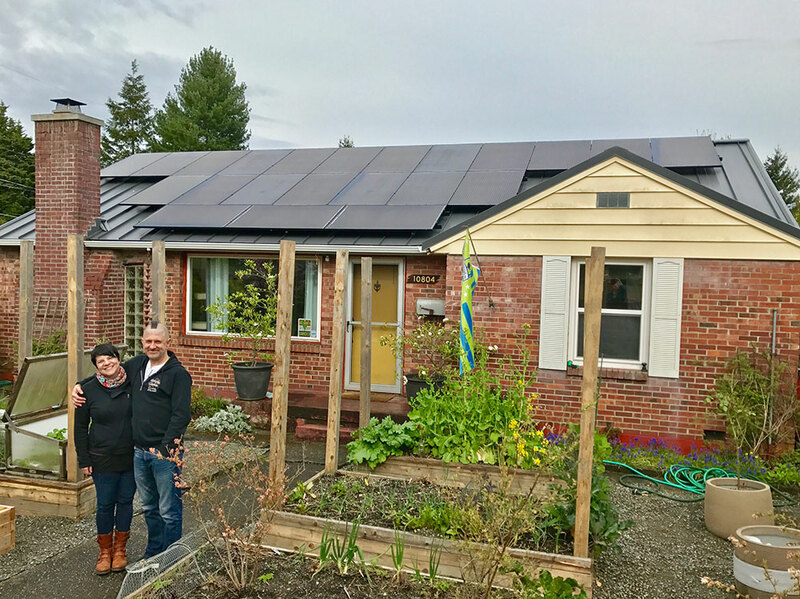 In conjunction with switching from oil heat to an electric heat pump system, Jen wanted to power as much of her electricity demand from solar. She was also getting a new metal roof installed in the spring, so the timing just made sense! 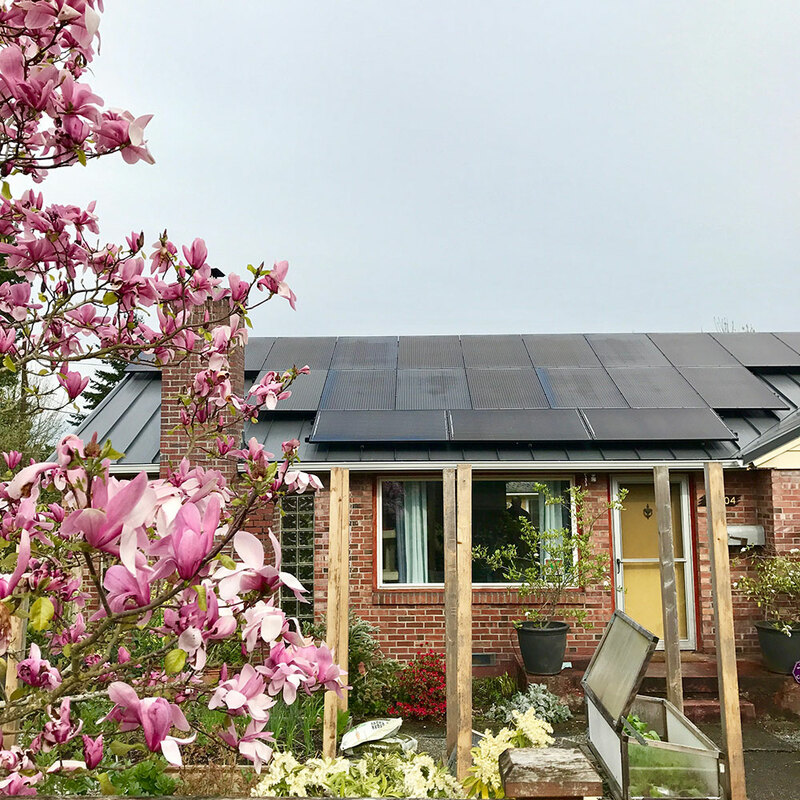 Jen’s home was originally using 8,300 kWh per year but with the addition of the electric heat and AC, SolTerra anticipated her electrical consumption to increase to around 12,500 kWh per year. When considering design of the solar, Jen was clear: “If we can fit it on the roof, we should install it!”. 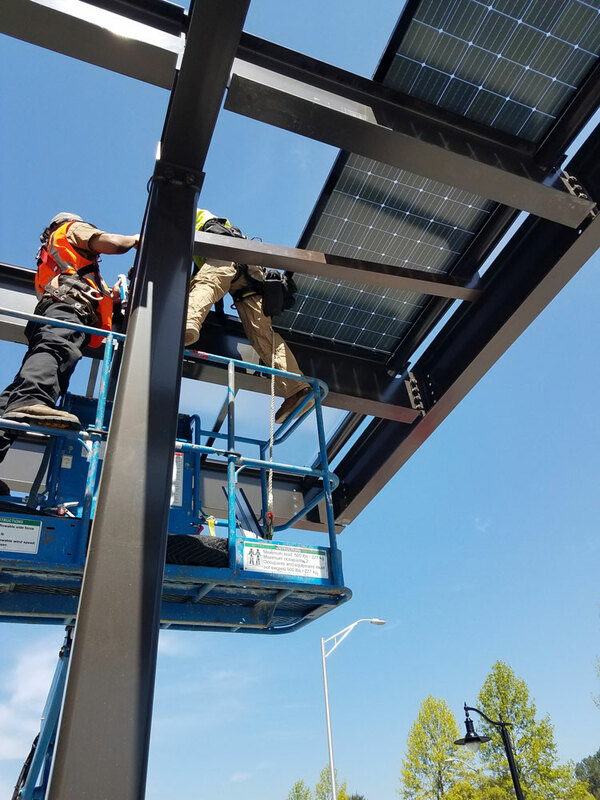 With that in mind, SolTerra designed and installed a 12.76KW install, which was estimated to generate 11,900 kWh in the first year. Aesthetics were also of concern as her roof was very visible from the street. She elected to install all black solar panels for the cleanest aesthetic possible. These panels complimented her new dark grey metal roof nicely and had all the neighbors envious. After having the installation for a year, the system produced 12,900 kWh and Jen’s home consumed 12,500 kWh. She can officially brag about being a net zero energy home! 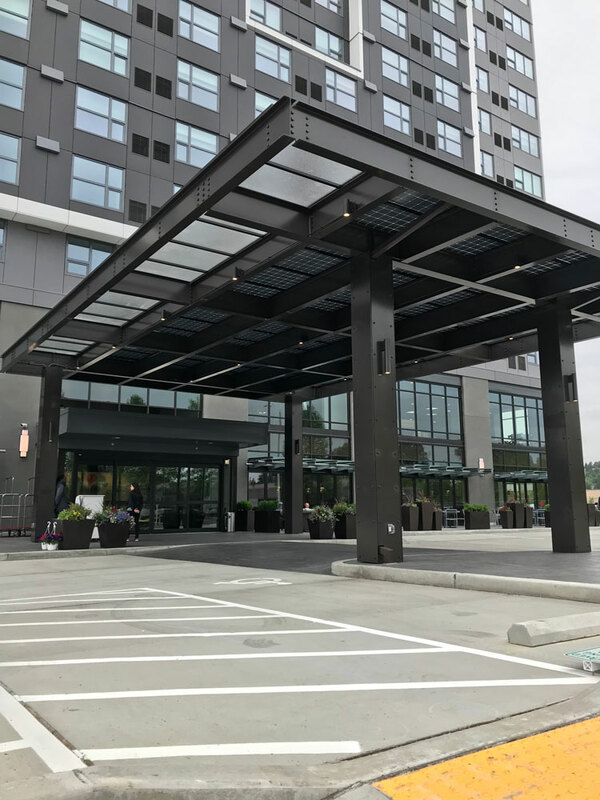 Real estate developers Omar and Christine Lee had the vision to bring a modern hotel to Tukwila, WA. 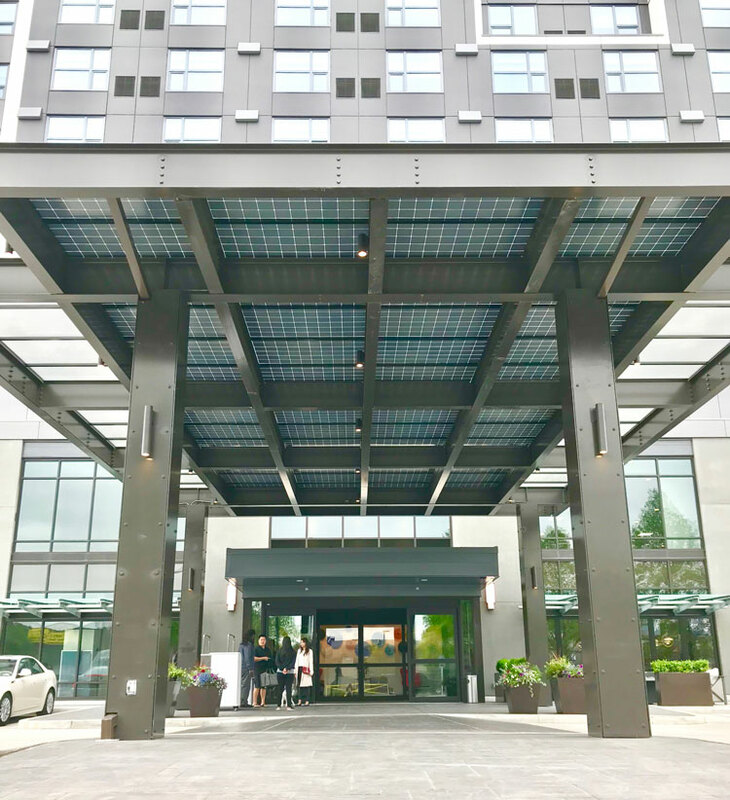 Just minutes away from the airport, the hotel was designed with a focus on technology and innovation, so including solar in their design was a natural progression. SolTerra first met with the Lees in the spring of 2016. The construction had only just begun and the Lees were interested in adding more sustainability features to their project. They were interested in adding renewable energy because they preferred renewable over the alternative choices and it made sense to take advantage of government incentives and tax benefits. When comparing SolTerra’s solar + steel cost after tax incentives to their original budget, SolTerra’s proposal was about 10% less. Furthermore, SolTerra’s proposal would be helping to offset their energy demand and would be a great marketing benefit. The steel Porte Cochere structure that would welcome guests to the front entrance of the hotel had already been designed at the point of meeting with the Lees. 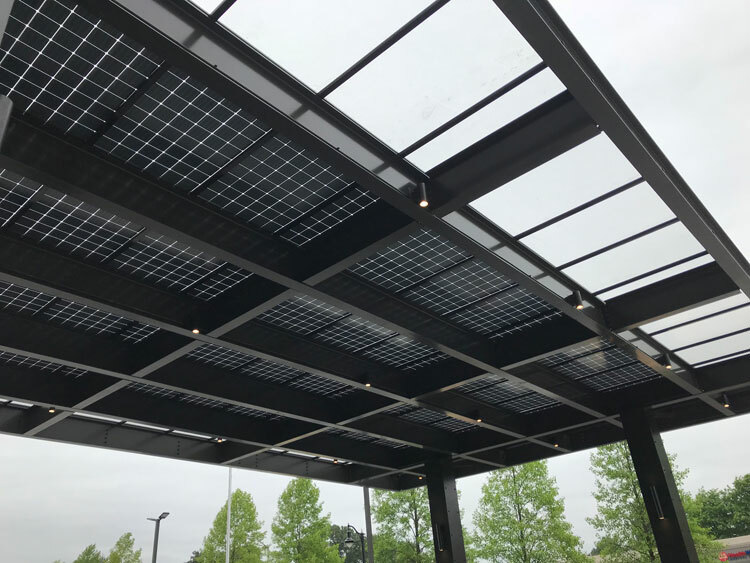 However, SolTerra was able to work with the structural engineer to adjust the layout of the steel beams in order to best support the solar glass as well as to obscure most of the electrical components that would have detracted from the overall aesthetic. 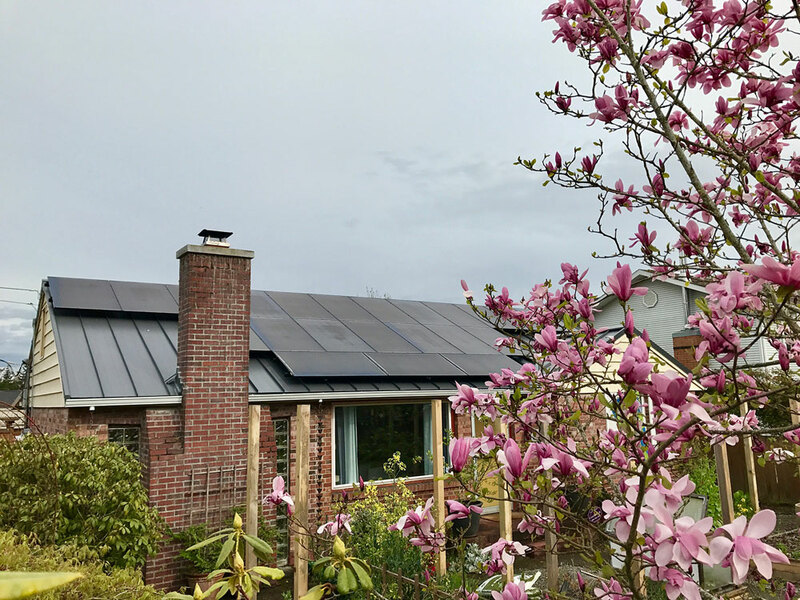 SolTerra elected to use Lumos solar panels because they let about 10% of natural light through, and they do not have any exposed electrical components. 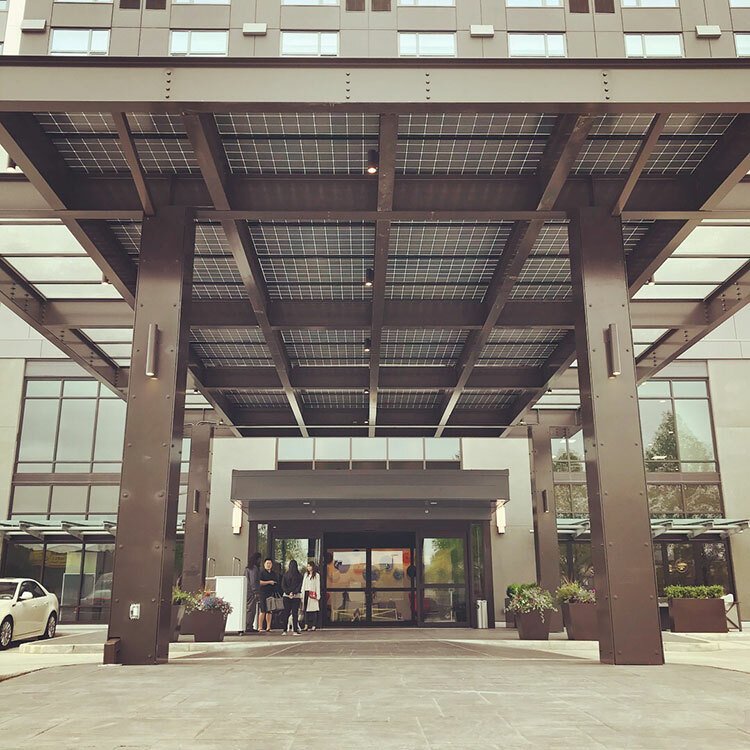 SolTerra completed the installation in time for the hotel’s grand opening in May 2018. The Lees have received numerous compliments on the final look of the Porte Cochere, plus they will get to claim 30% of the total project cost as a tax credit in 2018 and depreciate the project on an accelerated 5 year schedule.